Apple just turned 40. To mark the celebration, a list of the company’s 15 most important products beginning with the design of the iPhone and ending with the San Bernardino iPhone have been compiled by a team at Pop Charts Lab. “The Insanely Great History of Apple 3.0” ($90) is a wide-ranging visual overview of Apple’s work that allows you to see all the Apple’s products that have appeared in the last four decades at once. The original chart was created by the Brooklyn infographic-makers in 2011 when the iPad2 was the latest invention. However, the chart has now been updated to include everything right from the iPhone SE to 9.7” iPad Pro, both of which were added to Apple’s range of products after the recent Apple event in Cupertino. Like the original, the updated poster is arranged by year and device category (software, all-in-ones, handhelds, and so on). On one hand, where one can see Apple reduce from the huge Lisa to the Apple Watch, on the other hand, one can also clearly see the influence of Steve Jobs’ return to the company, in 1997. 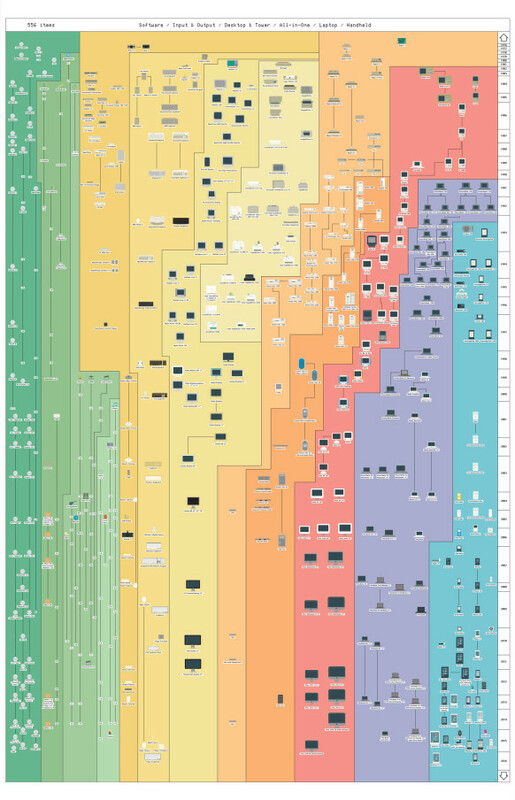 While the y-axis of “The Insanely Great History of Apple 3.0” shows the year, the top half of the chart is a collection of tiny icons. The poster’s bottom half which shows the period after Apple bought NeXT, and return of Jobs, the data visualization becomes thinner. Apple rolled out the rounded, colorful iMac, the iBook, and, a few years later, the iPod. A change in Apple’s strategy reflects due to fewer offerings: Instead of asking consumers to choose from a range of options, Apple would choose for them. Barring the exception of the handheld category, where choices remain a significant selling point, one can see that the post-Jobs years have followed that trend. On the bottom right-hand corner of the poster, you can see it mentioned in the data: it’s a group of gadgets, in a range of sizes.